A visitor to Nate’s blog caught my attention a couple months ago when he started defending the ‘traditional’ view of Daniel’s authorship and prophetic legitimacy. I couldn’t resist participating in the discussion, given the time I spent studying Daniel, as documented in my posts on the prophecies of the kingdoms, Daniel’s authorship, and whether Jesus fulfilled the 70 weeks. This is an interesting topic due to the potential it holds as perhaps the best candidate evidence for a divine fingerprint on the text of the Bible. Before going any further, let me start by saying that this visitor, Tom, has compiled the most thorough and reasonable defense of the traditional view of Daniel that I have ever encountered. I commend him for the time and effort that he put into it, even if I disagree with the conclusion. Regardless, in this post I want to review some of the new data I encountered (or more seriously revisited) during that discussion and offer some insight into why I find these ‘new’ arguments for an early authorship unconvincing. It is generally agreed that Ezekiel was initially composed within the period of the Babylonian exile, and more importantly, well before the 165 BCE date attributed to Daniel under the Maccabean thesis. This means that a reference to the person of Daniel in Ezekiel 14 would seem to confirm the existence of the person described by the book of Daniel, which is more consistent with the view that it is an early composition. I didn’t give this a lot of attention in my prior study because it wasn’t obvious, for several reasons, that this was a reference to the Daniel of interest (note that it is spelled slightly differently – דנאל in Ezekiel, versus דניאל in Daniel, with an extra yud – so sometimes people give the Ezekiel name as Dan’el) but it also didn’t seem that this was very important given that I agree with the scholars who see that some of the narratives in Daniel probably have their roots in traditional stories that pre-date the Maccabean composition. Regardless, Tom presented this as a key evidence for the early authorship of Daniel and much discussion ensued. The main thrust of the argument centered around the coupling of Daniel in Ezekiel 14:12-23 with Noah and Job as an exemplar of righteousness, and as exceedingly wise in Ezekiel 28:3. The primary alternate candidate for Ezekiel’s reference is to a Dan’el character known from Ugaritic sources and Tom argued that he is a poor fit due to his non-Yahwist allegiances. Eventually, Nate pointed out that Ezekiel refers to the “sons and daughters” of Noah, Daniel and Job, which is inconsistent with the life of Daniel from the book of that name. This piqued my interest and so I went back and re-read the passages from Ezekiel, at which point I was struck by a new insight. If I [Yahweh] pour out just one type of wrath (famine, animals, sword or plague) on a nation, the righteousness of people like Noah, Daniel and Job will only save themselves and no descendants will be spared. However, if I pour out all four forms of wrath on Jerusalem, you will see a remnant survive and their unrighteousness will show you why I brought punishment. So it seems like there’s two points being made: (1) the calamity which has befallen Jerusalem was not undeserved, and (2) the Jewish nation is special in that God will show them mercy and not wipe them out entirely. Now, if this is a proper understanding of the passage – and I think it is – then it makes absolutely no sense that Daniel, a member of the Jewish remnant, would be named as a member of the nations that would be devastated by the wrath of Yahweh in contrast to the Jewish nation (though Job and Noah, as pre-Abrahamic characters, do fit). For the first time, it became clear to me that Ezekiel was not referring to a contemporary young Jew named Daniel, regardless of whether he was referring to the Ugaritic Dan’el or not. At one point, Tom suggested that my post on the authorship of Daniel had incorrectly identified the commissioning of the Septuagint in the 3rd century BCE as only including the Torah – he believed that the Letter of Aristeas shows that all the books now included in the Tanakh were part of that effort. If this were true, and Daniel was included in that translation, then this would be a defeater for the Maccabean thesis. So I went back and reviewed the Letter of Aristeas again. First, a little background. The Letter of Aristeas is generally believed to be a later forgery that draws upon a series of possibly historical events which resulted in the commissioning of the official Greek translation of the Jewish law, known to us as the Septuagint. It claims that this was instigated by a suggestion posed to Demetrius of Phalerum, who was in charge of Ptolemy’s effort to collect “all the books of the world” for the famous Library of Alexandria. The majority of the letter references the “law of the Jews”, but in one spot – a purported memo from Demetrius to Ptolemy – it suggests adding translations of “The books of the law of the Jews (with some few others)”. This is the closest thing we get to a statement that the translation included more than the Torah. However, the purported letter from Ptolemy to the Jewish High Priest Eleazer only requests the law and the subsequent response from Eleazer to Ptolemy says that “I selected six elders from each tribe, good men and true, and I have sent them to you with a copy of our law“. At the very best, the initial memo which proposed “some few others” correctly represents the actual effort and those few extra books just weren’t mentioned in the later correspondence. In that case, there may be a slim chance that Daniel would have been included. It seems much more likely, however, that the earliest translation effort only covered the Torah. References to Daniel in …? One of the other key arguments raised by Tom was that Daniel had been referenced by several different pre-Maccabean texts. I had not previously encountered this claim for some of the alleged references, so I decided to dig in and take a look. As before, this would be devastating blow to the Maccabean thesis if true. [Tobit] envisages a second more general return from exile … as the prophets of Israel spoke concerning them, which is to take place at ‘the time when the time of the seasons is fulfilled’. This glorious future rebuilding of Jerusalem and its temple is probably seen by the author as foretold by Isaiah and Ezekiel respectively. But who fixed ‘the time when the time of the seasons would be fulfilled’ for this to happen? Could it be anyone but Daniel? I was interested to discover that the times and seasons language of Daniel was in fact present in Tobit. However, contra Beckwith, it does not put these words in the mouths of the prophets – rather, this is the language used by Tobit himself in his prophecy. So the direction of borrowing is not established, or even inferred, and it seems equally likely that the author of Daniel picked up this language from Tobit (or from the apocalyptic communities influenced by Tobit). It’s also interesting to note that Tobit claims to take place after the Assyrian captivity, which would predate Daniel. This means that if one is to argue for the early authorship of Daniel by suggesting that Tobit borrowed from Daniel, then it logically follows that the arguer accepts that there is precedent for Jews producing pseudoepigraphical works that were written after the fact to appear as if a known event had been prophesied. Sound familiar? Demetrius, in his book, On the Kings in Judaea, says that the tribes of Juda, Benjamin, and Levi were not taken captive by Sennacherim; but that there were from this captivity to the last, which Nabuchodonosor made out of Jerusalem, a hundred and twenty-eight years and six months; and from the time that the ten tribes were carried captive from Samaria till Ptolemy the Fourth, were five hundred and seventy-three years, nine months; and from the time that the captivity from Jerusalem took place, three hundred and thirty-eight years and three months. I could not extract any allusion to the 70 weeks of Daniel 9 (which proposes 490 years from the Babylonian exile to the final judgment) and Tom never responded with an explanation. Rouse thy anger and pour out thy wrath; destroy the adversary and wipe out the enemy. Hasten the day, and remember the appointed time, and let people recount thy mighty deeds. …  Bear witness to those whom thou didst create in the beginning, and fulfill the prophecies spoken in thy name. Reward those who wait for thee, and let thy prophets be found trustworthy. This whole case rests on the prospect that the phrase “the appointed time” is being borrowed from Daniel and that the ‘prophecies’ are referring to Daniel and not any of the other eschatological prophecies in existence at the time. However, there’s no clear reliance on Daniel and the phrasing of an “appointed time” is also present in other eschatological contexts (Psalm 75:2 & 102:13, Habakkuk 2:3). Lastly, Tom proposed that the visions of Zechariah only makes sense if Daniel was already known. I never really understood this argument and explanations were lacking, but I did discover something new in the process of trying to understand it: many scholars suspect that Zechariah and Haggai were once part of a single text. When taken as a whole, it appears very likely that the prophecies and visions therein point toward an expectation that Yahweh’s eternal kingdom would arise through the reign of Zerubbabel and the high priest Joshua (see Haggai 2:6-9 and 21-23, Zechariah 3:8, 4:9 and 6:11-13). This timeline is clearly different than one would expect if Daniel had been in view. There’s a lot more that was covered throughout the discussion and a ton of material in the document Tom put together but at this point I don’t feel the need to systematically dissect every single argument. The time spent researching these additional claims substantiated my suspicions that the ‘clear’, ‘obvious’ and ‘conclusive’ evidence for an early authorship is just as suspect as the data I had already reviewed. In the end, I feel pretty comfortable with the conclusions I’ve reached thus far – namely, that the book of Daniel, as we know it, was largely constructed in the midst of the Maccabean revolt by building upon a pre-Maccabean tradition to introduce prophecies that appear to predict events contemporary with the author. More specifically, my guess is that chapters 3 – 6 form the core of the pre-Maccabean tradition (though probably not as a unified text, and perhaps only as oral traditions). The dream and interpretation in chapter 4 and the hand-writing interpretation of chapter 5 then served as the inspiration for a Maccabean redaction to create the chiastic text of chapters 2 – 7, adding the chapter 2 and 7 prophecies, all in Aramaic. A second contemporary redactor then built upon this to add the introduction in chapter 1 and chapters 8 – 12 in Hebrew. As a young and volatile text, different versions, additions and arrangements of these redactions were available and are reflected in the Greek translations (LXX and Theodotion). This is my best shot at accounting for all the data. Yeah, I missed April. Hopefully I’ll make it up with an extra post in the near future. The argument from design is perhaps the most intuitive and immediately accessible argument for the existence of God and can be analyzed from a myriad of different perspectives. We are surrounded by astounding complexity and see purpose in nearly everything. William Paley was reasonable to suppose that the watch infers a designer and the design proponents are reasonable to say that life is brimming with the appearance of design. But fifty years after Paley’s death, Charles Darwin published “On the Origin of the Species” and the design explanation suddenly had a legitimate competitor. When I consider the arguments for these two options – design and chance – I find myself repeatedly drawn to a niggling question: if design is correct, why is life designed in a way that is plausibly explained without design? That is, if the designer wanted us to infer design then it would seem that he could have done better. Upon making this assertion, the apologist in my head immediately responds with an emphatic “Like how?”; inferring that I am posing an alternative that may not be viable. In this post my aim is to explore that very question through a few counterfactual conditionals. A counterfactual conditional is a speculative proposition about how things might be different. The conditional “If P, then Q” is a counterfactual if P (the antecedent) is false (or is implied to be false by virtue of Q – the consequent – being false). In considering counterfactuals, we draw upon logic and our inductively formed representation of how the world works to predict Q from P, then compare this to reality. Though speculative, a counterfactual argument can be persuasive when we hold a shared understanding of how the relevant aspects of reality actually operate. Before proceeding, we need to establish a definition for life. This is no simple task and is fraught with controversy. For my purposes here, I will adopt a simple chemical definition: life is unified material which is capable of producing new life. This definition is recursive, so that life must have the potential to perpetuate indefinitely so long as the source materials are available. Under this definition, the minimal life-form might be something like a network of RNA molecules, or even something simpler. We are really only familiar with one kind of life: the kind where amino acids combine in various ways and facilitate production of new life which is nearly equivalent to the parent(s). We see this in bacteria, flowers, frogs and people. We call it reproduction because the output is essentially a new instance of the producer(s). The variation from parent to child is relatively insignificant compared to the full volume of information embedded in the process. For our purposes here, we can essentially say that A => A => A => …, or, in other words, life form A only begets life form A and nearly all genetic information is carried forward. A => B => … => Z => A => …. The set of possible Rube-Goldberg like chains of production is enormous, so long as there is a recursive structure that allows us to avoid an infinite regress and constrain life as the set of outputs within the cycle. Otherwise – without recursion – every possible reorganization of matter would be “life” in some weak sense. What are the odds that life, under the guidance of purely natural processes, would arise to operate under this second mode instead of the first? This question is probably answerable even if I’m not going to try and expend the resources to calculate it here. Regardless, it’s clear that the probability of this occurring by chance is significantly less than it is for the type of genetic duplication we see in the world now. So, at the very least, we have identified a possible mode of life which would have been a stronger indicator of design than is inferred by the current paradigm. Perhaps the current mode of life was intelligently designed, but if so, then it seems that intelligence might not have wanted us to know. Nate’s post was spurred by a theist’s claim that our advanced cognitive abilities, such as “philosophical insight, scientific acumen, or mathematical skills” defy natural explanation. I responded by suggesting that the converse seems more accurate. We have become increasingly aware of our cognitive limitations as we have applied scientific methods to observation of human behavior, revealing a pervasive susceptibility to error through inherent biases and external influences (see Kahneman’s ‘Thinking Fast and Slow’ for a nice introduction). In fact, the scientific endeavor itself is a process for minimizing those errors. I outlined my own criteria for discernment (Part 1, Part 2) a few years ago when I realized that it was an integral and necessary part of any truth-seeking journey. But this goes beyond errors in judgment. A substantial body of research is showing just how fragile and malleable our long-term memories actually are. The memories of our past are largely reconstructed. Even our short-term memory is limited to about 7 items. Then there’s also the consideration of those alleged “mathematical skills”. Hasn’t the advent of computers shown us just how slow and error prone our math skills actually are compared to what is possible? There’s really no telling where we lie on the continuum of intelligence. Yes, relative to other lifeforms on earth we seem to be at the top, but as technological advances continue to give us glimpses into the kind of reliability which may actually be possible you can’t help but feel like we aren’t so close to the pinnacle after all. So, if a designer is trying to reveal himself through the gift of advanced intelligence, then why do these findings make it so easy to imagine a better human who isn’t dependent on tools and processes to mitigate against cognitive error and limitations? The holy books which purport to capture knowledge of supernatural origin also seem to be consistent with a natural origin and betray the humanity of their authors. Where is the evidence of a supernaturally gifted intelligence? It seems more likely that we’re just doing the best we can with the empirically grounded capacities which have aided our survival over the millenia and that we owe nearly all of our advanced knowledge to the cumulative efforts of past generations who have worked hard to pass on their knowledge of “what works” so that we don’t have to rediscover everything. When I saw the most recent post at 500 Questions about God & Christianity I couldn’t resist including it here. 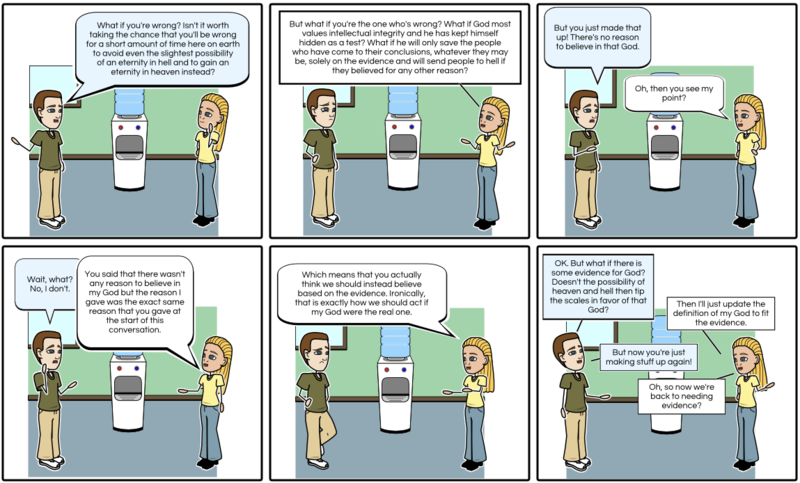 The post asks “Why doesn’t sin carry natural consequences?“, which he translates into a counterfactual near the end of the post when he says “If God is truly the creator, and the commands in the Bible are his (and not man’s), then we might expect to see the creator enforcing his rules through his creation, but we don’t (suggesting the laws laid out in the Bible were reasoned by men, and not God).” Or, to put it in the context of questioning biological design as revelation, “If God valued the revelation of moral truth (and thus his moral nature) more than our physical comfort then he would have designed us to discover moral truths in ways that are more efficacious than the way that pain teaches us to avoid physical harm”. Moral disagreement is rampant, yet we all pretty much agree that it’s painful to touch things that are hot or sharp. If you haven’t already, I highly recommend checking out the 65 other questions. The whole blog is pretty much one giant counterfactual argument. O man, who art thou that repliest against God? Shall the thing formed say to him that formed it, Why hast thou made me thus? At this point you may wish to accuse me of naive arrogance in supposing that I can deduce how God should behave. You are right, but I ask that you hear me out. Certainly, if God exists, I am in no position to tell him how he should act, but this says nothing of how we are to interpret the evidence for his existence. If I wake on Christmas morning to find a set of binoculars under the tree made out of two toilet paper tubes, scotch tape and string, it is entirely reasonable to conclude that it was produced by my children and not by Nikon or Bushnell. Likewise, if God wanted us to infer his presence from the life found in his creation, then it seems he could have done better. If God directed acts of special creation, or the course of evolution, then it would appear that he chose to leave a signature which is indecipherable from what we might get from a lawful yet unguided process. Does this sound like the behavior of somebody who wants us to know him? Feel free to share any other counterfactual arguments against biological design as revelation, or conversely, to show me the folly of my ways. Does belief in God improve cooperation? In case you haven’t seen it yet, a new study published today in Nature says that the answer is yes (a better summary of the study is available at ScienceNews). The authors go on to suggest that “beliefs in moralistic, punitive and knowing gods increase impartial behaviour towards distant co-religionists, and therefore can contribute to the expansion of prosociality.” In other words, the apologists have been right all along – we can’t be good without God. That is of course a sensationalized caricature of the study, but this isn’t really a surprising result given the data that we have already collected. For example, it has been well established that even just a subliminal hint that we’re being watched will yield more prosocial behavior. We’ve also seen that priming thoughts about God improves prosociality and that exclusion from a group decreases prosocial behavior. And on a related note, there’s good evidence that a belief in free will also increases prosociality. So the data has been pointing toward this conclusion for some time, but what does it really mean? Another bolus of research indicates that we are innately predisposed to God belief. Where the theist claims this as evidence of God’s fingerprint on our subconscious, the naturalist has responded with theories of agency detection. The research above has nothing to do with detection of agents but may still be relevant to the question of an innate God belief. While the benefit of agency detection certainly makes sense in the “you’re better off running away even if it’s only a tiger 2% of the time” sort of way, there’s still a leap to the theistic conception of an omni-God. Could it be that in the millenia which have ushered in civilization, a sort of natural selection acting on cooperation has bolstered and tweaked that innate predisposition into one which favors an all-seeing, omnipresent God who encourages our cooperation under every circumstance? Chaos in the absence of belief? The nones are growing at a rapid clip. Do these findings mean that the rise of an unbelieving society will degenerate into moral chaos? It’s obvious that Pat Robertson and much of conservative Christianity thinks that is the case, but perhaps we can flip the question on its head and ask whether the rise of the nones has in part been facilitated by the replacement of God with something else. Consider the far reaching scope of surveillance, the ubiquiti of mobile audio and video capture and the advances in forensics over the years. In the absence of an immediate deterrent, the odds that we will still be held accountable for our actions has increased dramatically over the last few decades. I wager that this has not escaped our attention. But if we are to take Steven Pinker at his word, we have also become more prosocial over time. So unbelief is on the rise concurrent with a rise in prosociality. The research cited above would predict the opposite result – unless some alternative is taking the place of God. Despite all the concern about our loss of privacy, perhaps Big Brother is just what we need. A day later and I discover that one of the authors on the study, Ara Norenzayan, published a book in 2013 that puts forth this same hypothesis – that “Big Gods” in modern secular states have been replaced by “Big Brother”. Check out “Big Gods: How Religion Transformed Cooperation and Conflict”. Apparently this is a hot topic. The Unbelievable! podcast aired an episode on this question less than two weeks before I posted (I just caught up to it in my queue). It was an excellent discussion and worth the listen. The defendant of the “watcher thesis” was Dominic Johnson, author of “God Is Watching You: How the Fear of God Makes Us Human”. Toward the end of the episode, it was interesting to hear him put forth the idea that Big Brother might replace God (in this particular regard) in modern secular societies. 2015 was an embarrassingly quiet year on this blog. I spent a lot of time early in the year reading and thinking on moral ontology and after outlining a big multi-part series of posts on the topic I found myself all wrapped up in semantics and disenchanted with the project, so I abandoned it and took a break. More recently the dearth of content has been primarily driven by a need to spend my time on other matters – a condition that will almost certainly persist for the next few months. Regardless, I want to do better. There are still so many ideas and so much content that beckons. With a profusion of drafts patiently waiting in my queue, I know I can muster up a few hours a month to publish something. So that’s my goal. At least one post per month this year. Even if it means cheating and publishing some pithy article with minimal meaningful content – you know, like the three week late “new year’s resolution” article that you’re currently reading (January……..☑). In preparation for this, I reviewed my drafts and consulted my Magic 8-ball and put together a sampling of article titles that I would like to try and complete this year. Let me know what you think looks most interesting and maybe I’ll prioritize accordingly. I look forward to many interesting discussions in the coming year. Hopefully. Oh crap. Did I really just quasi-commit to one post a month? Wow, it’s been nearly 6 months since my last post. How did that happen? Oh well. I still have a lot of posts in the works, and someday I hope to actually finish and publish them, but for now I just wanted to offer a podcast recommendation. Phil Harland is a religious studies professor at York University in Toronto and runs a podcast called Religions of the Ancient Mediterranean. I just finished listening to the first seven series and, while much was familiar, it was very educational and a great way to experience a scholarly yet secular view on Christian origins and related topics. I highly recommend adding it to your collection of listening material. Enjoy! What is a moral claim? I thought I had something like an epiphany several weeks ago and had finally identified a theory of ethics that I could say was, from my perspective, “most probably true”. I started writing and had drafted outlines for a 9-part series. I wrote, and read, and thought … and then I stopped. I hit a wall. The theory, like every other moral theory ever, was incomplete. There were unexplained assumptions and unanswered questions. Moral Realism: Moral claims can be true or false and some are true. Despite my interest and reading on the nature of ethics these last couple years, my prior conception of moral realism did not align with the definition above. Through numerous sources and interactions I had been led to define moral realism as requiring ontological independence – that morality, in a sense, exists on its own in some way (though I should note that the SEP article does add the disclaimer that “some accounts of moral realism see it as involving additional commitments, say to the independence of the moral facts from human thought and practice, or to those facts being objective in some specified way”). I guess that’s what happens when most of your education on ethics comes from sources in the God debate. Regardless, the definition given above is much less restrictive in its application than I had previously conceived and as I pondered this I found that it opened the door to new explanations for our intuitions regarding the truthfulness of moral claims, though I eventually began to doubt that I was really heading toward any kind of solution. Even so, I’m not yet willing to admit defeat, so I’m calling in reinforcements (yeah, that’s you). I have several “open questions” and I would like to solicit your input to help me clarify some things. My first request is for answers to the question “What is a moral claim?”, but before you answer, let me give you something to think about. It is wrong to skin a cat. It is wrong to turn a screw left to tighten it. It is wrong to turn a screw left to tighten it on a Wednesday. Now the turning of a screw has become a moral claim. What changed? What is it that makes #1 and #3 moral claims, but not #2? As best I can tell the difference is in the referent of ‘wrong’. Claim #2 is referring to a goal – the outcome of tightening the screw, so ‘wrong’ in this context means that the goal will not be met. What is the referent in #1 and #3? Well, the referent seems to be morality itself – some standard of good and bad that isn’t really definable in any other terms without presupposing the existence of morality itself. That does not, however, mean that morality is thus necessarily independent of everything else. It simply means that our faculties are not equipped to define it by reference to something else. As far as I can tell, this leaves us with some form of moral realism – and it’s worth noting that under the definition given above, relativism is a form of realism. It is just a limitation on the scope of the moral truth. As far as I can tell, this throws various forms of anti-realism out the window. There may be gray areas where it’s hard to tell whether something is or is not a moral claim, but at the extremes even an anti-realist can identify a moral claim from other types of claims. There must be something that they’re drawing upon to do that. That “something” may reduce to emotions, or some neurochemical state, but that’s still something. It’s real. What do you think? Am I right about this? Does our ability to distinguish moral claims from other claims require moral realism? PS: If you’re interested, this theory that I’ve put on ice is somewhere in the vicinity of contractualism with a contract that is based on negotiation between the core value judgements of all parties, rather than rational agreement, where by “core value judgements” I mean something like what we see in Jonathan Haidt’s moral foundations. Those quotes refer to three key ingredients which go beyond the objective data about brain activity that we can gather through fMRI, EEG and the like. Dehaene identifies these ingredients as conscious access, manipulation of conscious perception and, as noted, careful recording of introspective reports. He then goes on to further define each of these. Conscious access is defined as the awareness of specific information – it’s the foundational definition of consciousness that underpins more elaborate attributions, like self-awareness. As is elucidated in the book, our brains actually consume massive amounts of perceptual data. Much of what is received by our senses and processed in our brain eludes our conscious awareness. Conscious access is that sliver of data which enters our stream of thought from amongst the mountain of perceptions which bombard us from without and arise from within. Our conscious access is reportable. As I type this, you are receiving a report of my conscious access. We cannot report on that which we are unaware of, so it is by definition that reports are only informative with regard to the content of our conscious access. Experiments can build upon this by asking participants to focus on a particular element of their perceptual space that has been carefully crafted by the experimenters. This manipulation of conscious perception is the experimental variable that allows the researchers to segregate the data into that which correlates with consciousness and that which does not. Dehaene outlines several primary manipulations – binocular rivalry, attentional blink, subliminal stimuli – and references several others throughout the course of the book. Each of these present an opportunity to separate conscious processing from unconscious processing and so look for the signatures of consciousness. Dehaene then goes on to highlight the massive amount of work that our brains are doing subconsciously and how this surreptitiously influences our conscious access. Research in this domain paints a picture of the inverse side of consciousness and offered a baseline against which consciousness can be compared. After taking a side trip into discussions about the viability of the evolutionary origins of consciousness as a tool for organizing and prioritizing the competing interests in our subconscious processes, we are introduced to the findings that this recipe has thus far wrought. The common attribute which ties these signatures together is that they all represent prolific activity across large areas of the brain. In contrast to Descartes’ pineal soul-suite, the evidence points to consciousness as a phenomenon that is spread throughout the brain when a massive avalanche of distributed activity is launched. This excitation is what Dehaene calls “global ignition”. After having presented all of the correlative data Dehaene anticipates a common objection – correlation does not equal causation – and so he offers evidences to support the proposal that brain activity is more than just a side-effect of the ghost in the machine and that there are reasons to believe we are glimpsing consciousness itself. The first stop for the counter against this objection comes at the Centre for Systems Neuroscience at the University of Leicester in the UK, where Rodrigo Quian Quiroga enjoys probing individual neurons and finding ways to incorporate pop culture icons into his experiments. He has spent the last decade examining the relationship between conscious access and discrete patterns of neural firing at the level of individual neurons. The short story is that through a novel technique pioneered by Itzhak Fried, we have been able to take advantage of the surgeries performed on epilepsy patients to implant fine electrodes that record from individual neurons. When these are monitored during experiments there are very specific relationships found between perceptual and recollected concepts and individual neurons. Those experiments have not only identified a link between concepts and individual neurons, but the same tools used to investigate consciousness have been utilized to show that some neurons are only linked to conscious perception of stimulus – in effect, the neuron can be said to be a part of a conscious thought. These findings have been documented across many publications, but a few of the key overview papers are “Concept cells: The building blocks of declarative memory functions” and “Brain Cells for Grandmother“. Furthermore, similar findings led to the awarding of the 2014 Nobel Prize in Physiology or Medicine for the discovery of place cells; individual neurons which correlate with our location in space. These were first discovered in rats and then subsequently also identified in humans. The extrapolations we can draw from the discovery of an association between individual cells and conscious perception are potentially monumental. In particular, it does not seem inconceivable that perhaps some day we may be able to translate the philosopher’s qualia as a pattern in the brain. While fascinating, the added specificity of the single neuron experiments has not yet established causation. It could be that those individual neurons are simply assigned dedicated roles as the bridge between body and particular concepts of the mind. Perhaps in those experimental observations we are simply bystanders watching as the train of thought passes by. That is not impossible, but there’s more to examine. The next stop starts with a bit of time travel back to the early 20th century, when several parties began toying with transcranial magnetic stimulation (TMS) and reporting various sensory anomalies in conjunction with the activation of the coils. Vast improvements in the equipment have allowed these experiments to continue today with sharp precision that enables experimenters to focus the stimulus to specific regions of the brain. In doing so, they have been able to trigger domain specific sensory illusion – light when there is none to be found, motion while sitting still and color in a monochrome scene. Perhaps more significant, however, is not the creation of sensory perception through TMS, but rather the disruption of consciousness itself through the same mechanism. Magnetic pulses targeted toward the long-distance networks that facilitate global ignition have been shown to eradicate a conscious perception that would have otherwise obtained. Even more relevant to the question of the interplay between the subjective and the objective is a study in which the prefrontal lobes were overwhelmed with pulses, leaving an effect which lasted up to 20 minutes. During this time, the subjects were asked to perform simple tasks of judging shapes that were presented to them. Objectively, their accuracy was effectively equivalent to their performance prior to the stimulation. Subjectively, however, they reported significant doubt in their answers. Objectively they were just as capable but their conscious awareness of their judgement had been impaired. Before closing this section I must acknowledge that for the resolute dualist, we still haven’t fully addressed the objection. Maybe the TMS is acting in the place of our sensory input, stimulating or disrupting those neural mind-bridges in such a way that the mind thinks it is receiving or missing sensory data. OK, then let’s go beyond the content of the book and take a look at some additional research. If we say that the mind is distinct from matter then theoretically our memories are also made of mind stuff. However, starting about 70 years ago with Wilder Penfield experiments have been shown to trigger memory recall through direct electrode stimulation of specific brain regions. Whereas the dualist could argue that this stimulation is no different than the recall we experience when a familiar sight or sound is encountered through sensory input, the distinction becomes apparent when stimulation is used to disrupt conscious memory recall. For example, by acting directly on brain regions associated with verbal memory, electrical stimulation can directly impair recall of names for familiar objects and this phenomenon is often used to locate brain function through the process of cortical stimulation mapping. It is not that the person’s sensory perception of the object is disrupted but rather that their recall of the memory content which associates words with the object has been impaired. I find it difficult to understand how this result fits into a dualist framework. In total, there is a large body of evidence that the content of our thought-life is causally connected to our neurology. We have opened an objective window onto the world of the subjective and on to consciousness itself. Massive projects are underway and, though we are still far from grasping the means of translation between the subjective and the objective, the future appears to be one in which mind and matter are proven to be one and the same. Dehaene outlines his theory of consciousness in the fifth chapter but it’s really just a review of the ideas that he has already outlined in the previous chapters. His theory, in short, is that consciousness is roughly equivalent to the concept of “global ignition” introduced above, with the added dimension of feedback loops containing the information which persists to define our subjective experience. This is what he calls the “global neuronal workspace” theory. Information is shared throughout the brain as an evolutionary adaptation which allows us to utilize it in various ways and prioritize our attention. Within this discussion several neural computer simulations are presented which demonstrate a similar type of threshold ignition and feedback, which is central to the theory, even though that particular behavior was not deliberately designed into the model. Then, having built his theory of consciousness upon the key signatures identified above, Dehaene sets out to find a way to test it. It is one thing to find correlates of consciousness, it is quite another to use that information to build a reliable “consciousness-o-meter”. The proving ground for this theory is found in one of the most difficult medical scenarios; that of the vegetative patient. We are introduced to the spectrum of states which manifest in response to a severe insult to the brain: from brain death, to a vegetative state, to minimal consciousness and locked-in syndrome. That last of these occurs when a fully conscious brain is “locked in” to an unresponsive body, as was the case for Jean-Dominique Bauby when he authored The Diving Bell and the Butterfly with just one blinking eye. The difficulty in these cases is that with only the subject’s external, objective behavior available to the clinician, the ability to determine whether there still any internal conscious life and hope for recovery is radically impaired. What’s worse, the manipulative tools which were used to detect the signatures of consciousness in the lab are also taken out of contention due to the inability to rely upon the subject’s ability to focus their sensory perception and report on their conscious access. An alternative technique relies on the observation that we are wired to detect novelty, such that changes in our surroundings trigger a response in the brain. This trigger, however, fires even if the novelty never enters our conscious awareness. That, in turn, means that the novelty itself is not sufficient for establishing the baseline that discriminates between the unconscious response and conscious detection of the change. To get around this the research team devised a clever tool called “global auditory novelty”. Relying upon the fact that the sense of hearing is rarely lost in these brain injuries, the subjects were presented with a pattern of four “beeps” following by a “boop”. The “boop” represents the local novelty which triggers the subconscious alert that something has changed, which may or may not enter our consciousness. Our long-term, or “global” conscious perception, however, is a bit more sophisticated. Once this pattern is repeated enough times the “boop” becomes part of the expected sequence even though it triggers the alert in the brain. This causes the “boop” to eventually slip out of our conscious awareness. So, by repeating the pattern several times and then replacing the local deviant “boop” with a global deviant “beep”, the team was able to induce a situation in which the subconscious alert was silent while the conscious detection of a global novelty was ignited. What was the result? In the initial trial with eight patients, all three of the minimally conscious patients whose EEG’s lit up with the P3 wave in response to the global novelty later regained consciousness. In a subsequent study with 22 vegetative subjects only two yielded a P3 wave and they both became minimally conscious in the following days. While these initial tests were perfect in that they never yielded a false positive, there were still several false negatives. To address this the group compiled their data and ran a statistical analysis to refine the prediction from the EEG waveforms. This refined calculation, which incorporated the full suite of EEG data and the other signatures beyond just the P3 wave, led to an exciting result. Using a data set of over 200 patient they found that in 33% of the cases where the clinical diagnosis was “vegetative state”, the refined analysis yielded an alternative diagnosis of “minimally conscious”. Of these, a full 50% recovered to a clinically obvious conscious state in the next few months, whereas this false negative rate was otherwise only at 20%. Adding these up, we see that the clinical diagnosis was overly pessimistic for 30% of the patients while the EEG signature diagnosis was overly pessimistic for only 13% of the patients. For families struggling with questions about how to manage the care of their loved one as they cling to life, this objective detection of consciousness through physical measurement of brain activity may be the key to maximizing the realization of their hopes. While I am not yet willing to express a level of confidence on par with Dehaene regarding his conclusions, I am obliged to say that I agree (and I posted similar thoughts on free will in the post which inspired those introductory comments last month). Even so, neuroscience may never be able to deal an incontrovertible death blow to the dualist paradigm. Like Sagan’s infamous garage dwelling dragon, the mind can always be excused from questioning and made into an extra immaterial layer that mirrors the brain even at the level of individual neurons and synapses. At some point, however, it becomes clear that we are just playing games. When that time comes, if it hasn’t already, we need to acknowledge the data for what it is and the implicit conclusion that we are nothing more than our physical body; that our identity – our conscious self – is found in our brain. Two years into this journey and I find myself at a place where I can scarcely imagine reaffirming Christianity as the best explanation of reality. Even the most “liberal” flavor of the faith looks difficult to swallow. But there is more to life than knowledge and sometimes the most rational thing we can do is eschew truth. Don’t tell me it’s a sugar pill if it is truly my best shot at feeling better. Just lie to me and give me the damn pill. It’s like asking somebody to forget what they’ve seen. We can’t choose to forget. It may happen naturally over time, but we can’t will ourselves to forget. … I could ignore those issues, do everything I can to avoid discovering new ones and pretend that they’re meaningless. Over time, that would probably work and the issues would fade into the background. This is where the choice comes in. I could choose to do that but then I would be living a lie for 5, 10, 20 years, or however long it takes for the issues to fade away. Instead, I’m choosing to face the issues. If Christianity is true, then I think that my journey should lead me to that conclusion. Amongst the countless hours of reflection over these last two years there have been many occasions where I could identify a practical benefit to the Christian worldview. In an earlier post I acknowledged that there is a strong psychological allure in Christianity, namely in the belief that we are not simply at the mercy of chaos and that, in the end, victory will be ours. It is easy to understand why we would want this to be true. These beliefs, however, can and do extend beyond the conceptual and impact us directly in the here and now. Some would argue that holding unsubstantiated beliefs is in some sense wrong (Clifford’s Principle) – but I disagree. I contend that if holding a belief is clearly the best way to attain a desired outcome then it is completely rational to hold it. So this is want I want to examine. What benefits does Christianity enable us to realize in this life, and is adherence to the Christian worldview the best way to attain those benefits? In other words, does the cost-benefit analysis favor Christian belief over all other possible mechanisms for leading a fulfilling life? To start, I’ve identified a few benefits and costs to explore. This post is in large part a request for your input on these and for other practical factors that I should consider in subsequent posts. I crossed out #2 on the costs lists because it would be begging the question. If it turns out that the pragmatic benefits of Christianity outweigh the costs and they are not otherwise attainable then the allocation of resources to the Christian cause should actually be viewed as appropriate. Additionally, I need to point out that I am well aware that many of the benefits listed here are not exclusively found in Christianity. The exploration of alternative mechanisms for realizing those benefits is a crucial element to this series. If you’re wondering why I haven’t included the afterlife in these lists, see my post on Pascal’s Wager. On the surface, this topic might seem contradictory to the perspective I offered there – namely that we shouldn’t believe something just for the benefit. However, there is a vast difference. Pascal’s Wager is based on a purely speculative outcome obtained via a purely speculative mechanism. Conversely, in this case we can draw upon our experiences, psychology and other research to understand probable outcomes in this life. This isn’t a tidy, well-planned series. My coverage of these topics will span a long time and will be interspersed between plenty of other posts that I’ve already dreamed up. This isn’t the type of thing where the answers are just sitting out there waiting to be found. There are a lot of factors at play, a lot of psychology to sift through and the end result is enormously subjective. Hopefully your interactions will keep me grounded. Finally, please do not misinterpret this exercise. I can imagine how this might be psychoanalyzed. I’m not in some dark place looking to reclaim the joy I had when I was a Christian. I don’t know how to compare distinctly unique stages of life, but its possible that I’ve never been happier. Ironically, the motive behind this exercise is very non-Christian: if this life is the only one I have then I should pursue the course which makes the most of it. This journey is about more than collecting facts and discerning the structure of reality. It’s also about navigating life, and I went public with this blog because I knew that my best shot at success was to incorporate a wide variety of insights from others. So please let me know your thoughts on this topic in general, and on the individual benefits and costs of a Christian worldview. Thanks in advance. Added #7 on the benefits side and clarified that I am aware that many of the listed benefits are not exclusively Christian. Added #8 on the benefits side and #6 on the cons side after contemplating this post at Finding Truth. I have thus far failed to follow-up on the larger question I posed here but it’s not off the map. Someday I’ll get around to it. As far as I can tell, Pascal’s Wager is rendered impotent by one simple thought experiment. As always, please tell me if there’s something I’ve overlooked. If the text is difficult to read, click on the image for the full scale version. It’s important to note that this says nothing about the probability of God’s existence, or about the evidence therein. This only shows that the assignment of unsubstantiated attributes or actions to a god do not serve as reasons to believe in that god. Now, if you can provide evidence of those attributes or actions (e.g., that acceptance or rejection of a particular belief actually determines one’s afterlife), well, then you’ve got something. Proudly powered by WordPress Theme: Able Child Theme.